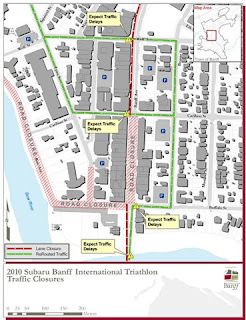 As part of Parks Canada 125th Anniversary Celebrations, along with the Town of Banff and Banff Lake Louise Tourism, Banff will host the Subaru Western Triathlon Series this upcoming Saturday, September 11, 2010. Please do not expect to see the swim start at Two Jack Lake, as mass transportation will be used to get the athletes to the start area. But be sure to get to Banff Central Park and Banff Avenue. Athletes will enter the change-over area in the switch from cycling to running in Central Park. 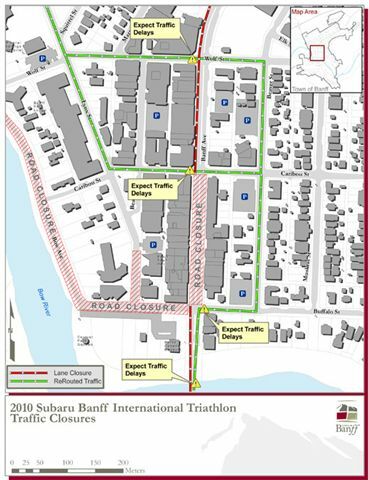 With the running course, you will be able to view runners up to four times and the finish line will be on Banff Avenue. In order to accommodate this event, Bow Avenue, along with 100 Block of Banff Avenue along with a section of Buffalo Street will be closed. Awards will be presented in Central Park at 1:30 pm.